In all its mysterious majesty, there is nothing more beautiful and yet so treacherous as the ocean. It tantalizes all of your five senses with its glistening vastness, salty smells, crashing waves, cool breezes and natural shorelines. This classic pokie will transport you to your favourite of the 7 seas and create a peaceful diversion in your day. This 3 reel, 1 payline pokie offers a betting range from $.25 – $5.00 per coin and you can bet up to 3 coins for a maximum bet of $15. With dynamic pokie, your top payout on a 3 coin bet is 4,000 coins. Set against the deep blue oceanic backdrop, the game features graphics incorporating colourful sealife like various tropical fish, coral, starfish anemone, and even mythical undersea treasure chests, overflowing with opulent gold and jewels. The glossy 7 Oceans symbol highlights the design at the forefront and the reels include symbols such as single, double, triple or any bars and three different versions of the 7 with a range of payouts for each. With the pay chart built-in to the game, you can easily determine what to be based on the payouts outlined for each coin wagered. 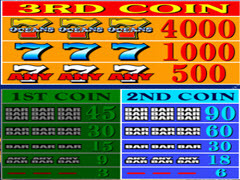 While there are no wilds, scatter, multipliers or other bonus features offered by this game, you can play in expert mode and use the autoplay feature to enable a tranquil experience without the interruptions of the more complex features of numerous other offerings in the online casinos. 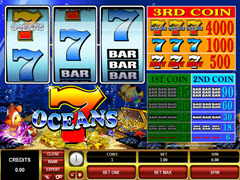 7 Oceans is a completely straightforward game that doesn’t try to confront its players with lots of bells and whistles and as such, will be greatly appealing to those with a loyalty to the old-school pokie. It will also work well for someone just trying their hand at online slots and will make for an easy transition into the genre. Depending on your bet, you could work your way into a possible payout of up to 60,000 and easily pass an evening enjoying this game.